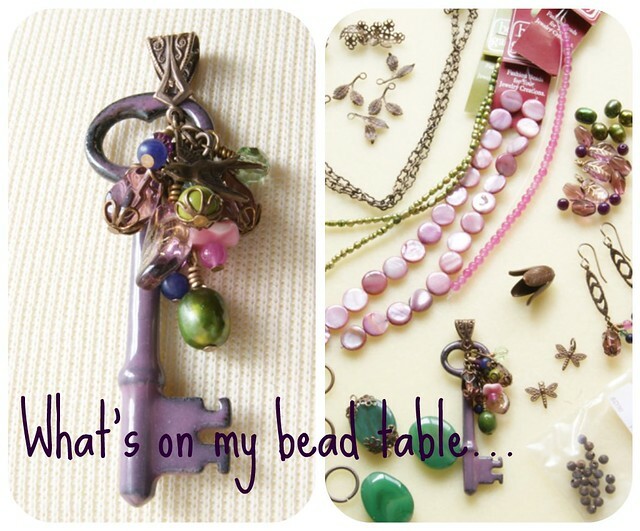 It's Bead Table Wednesday! I've received my first online bead order from BelloModo, which was full of Vintaj goodness! This key was on my table a few weeks ago, but I've been in the middle of a studio move and re-organization,so it's been delayed. I've finished my focal, and look forward to stringing/linking my new components into a complete piece! Inspired by Monet, this set will feature purples, greens and pinks with botanical and nature-themed accents. How is your studio set up? Studios are such a site-specific endeavor! Though I've tried to research the best organizational methods, I've found everyone's space/budget/resources to be completely unique. I encourage you to mindfully determine your own needs. Creativity occurs at the heart, no matter the space, budget or audience! If you are serious about a jewelry business, then no matter what, organize those beads! 1.) You're not alone! Look at my mess! For too long I've been stashing my bead finds in a mish-mash of varied containers. Consistency and uniformity are key to a successful organizational system. 2.) Enter the label-maker and simple containers. I've separated my beads by vendor, color an function. This way I can easily pull the pieces I need, reference what I have used and clean-up will be easy! 3.) I (luckily) salvaged some flat files from a down-sized company. These are essential for the fine-art component of my business, but are also helpful for beads! 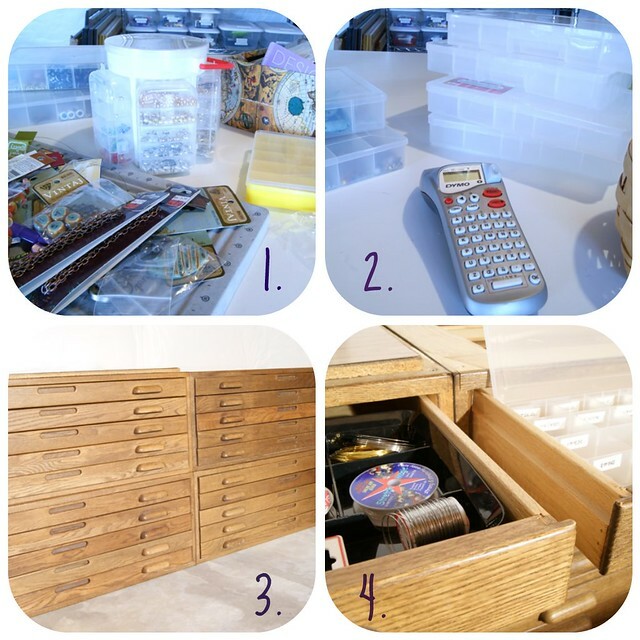 You could also stack your bead organizers on shelves or in a re-purposed dresser. 4.) I also utilized black desk-drawer organizers for threading elements, and labeled compartments of my bead organizers for specific components. With meticulous labeling, I can easily access a specific tool, as well as reference a component in my beading resources. Once you make that gorgeous jewelry, you have to photograph it! Another important component of a successful beading studio is an area specifically designated to photography. Focusing on available sunlight, I have set up a table, prop shelf, and mannequin near a window in the studio. Even if you don't have an area you can permanently dedicate to photography, find a place with a table near a window and keep a plastic tub full of your props close by. A light tent, with additional lamps, is an essential tool for photography when light is not ideal in the studio (night, cloudy day, etc.) Props: busts, books, vases, glassware, etc. are also crucial for adding interest to your jewelry photos. Personally, I feel a life-sized mannequin is a necessity for building your jewelry pieces, as well as communicating their scale. This is the first of a series of studio organizational tips. 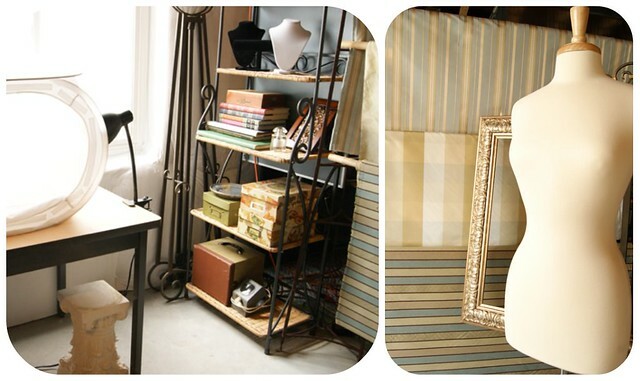 Are you having difficulties organizing your creative space? Do you have advice to share with other artisans? Oh Yeah for you I LOVE that key the colors are so beautiful together. I would have a great space except that it freezes over for half the year. Part of my goal is to be able to by myself a wood stove so I can work in there year round. When I'm not in there I'm in the dining room which we don't use so much but is open to the rest of the house. The kids are always wandering by, picking up stuff, or dumping stuff off so I really miss being able to hide away and close everything off. I got those same bead containers and organized by color and type ie decided to put all ceramics together etc. Love them!!! I also need an Ott light for dark days - there are a lot of those here in the Northeast winter! Happy Wed Erin! I'm impressed at your dedication, Patty! A wood stove, and maybe some fingerless gloves?! Luckily it's warming up-maybe you can move into your new space and then it will be too hard to move out next winter and you'll have to get that stove! Those bead containers are the best thing $1.99 can buy...just went back for 9 more of them!! I'm so excited for you! I had the pleasure of this experience early last year when my basement studio space was finished and I got to set it up. Mine is a sunny yellow. It's never done, by the way . I love your flat files. The wood is beautiful. I have an old rusty metal map case I use for organizing beads by color, but then, I like rusty and old. I also bought one of those vertical craft cabinets. I'll take more pix for a Studio Monday blog post one of these days. Enjoy setting up your studio and know you can re-arrange it lots and lots!